Art style: Absolutely amazing, the maps feel unique and everything looks like it fits. Love it! Combat: This area definitely has a lot of room to improve. Figuring out all the abilities and what they do/how you can chain certain ones together was pretty fun, though I feel after that initial learning phase it became a lot like a dungeon crawler where you’d just spam the most effective abilities all the time and disregard most of the rest. Gauntlet covered most of my thoughts about melee in his post but I’d like to emphasize how important it is that feint to parry/combo feint to parry work more responsively, it feels clunky and restrictive to not be able to defend yourself when you want to. Speaking of defending yourself, I’m really not a fan of the parrying system. It feels like an intentional skill cap made to limit how good you can be as an individual by only allowing you to actually defend yourself 2-3 times (depending on the weapon’s parry drain) before the game decides you shouldn’t be alive anymore. This coupled with the huge parry box and holdable parries make melee fights extremely shallow and turn into who can out stam the other person first, since if you get the stamina disadvantage (lower stam than your opponent) the other person can just tank your hits and force you to die. This makes being super aggressive the optimal playstyle, especially with the incredible slow health regen. That’s in 1v1 anyway, 1vMany is basically hopeless because of the parry drain and lack of needing to time parries, there’s just no way to win even if you play optimally because of the game’s mechanics, which in my opinion isn’t very fun. The lack of sprint doesn’t help this either as it reduces the amount of footwork and evasion you can do, in turn reducing combat depth. Attack animations also sometimes look jerky, a faster windup as Gauntlet suggested would probably make them seem smoother. Hits don’t quite feel like they have the same satisfying impact as in Chivalry. Setting: It’s interesting, I definitely want to learn more about the lore and characters, why they’re fighting, where this is taking place, etc. The names (teams, characters) are very unique but I think it might hurt more than it helps. The only names I remember is Taurant and Azar, and that’s because I mainly played Taurant. Maps: Other than the fantastic art style and environment, the level design isn’t really anything special. 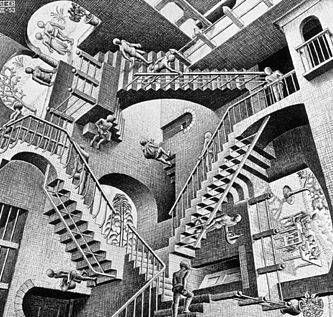 I found it somewhat difficult to navigate the Ravine map because of all the catwalks and staircases, it felt like playing in that one MC Escher drawing, and there’s a few misleading areas that look like you can jump over to but end up falling in the water. Overall it isn’t bad though. Summary: Love the aesthetic, combat is too shallow, names are hard to remember, maps are okay. I wrote as I thought of things so sorry if it reads babbly and jumps around to different ideas. These were my first impressions after about 7 hours of playtime with ~5 players, and despite my criticisms I did enjoy myself and had a good time. This game has a lot of potential and I really want to see it succeed. RE: Chivalry vs. PAYDAY2: crossover content coming soon! New helmets really don’t look that bad imo, fits better than some of the polycount stuff (looking at you, burning sun brandi). RE: Why remove FHF 3 years into the game? Mercs has every weapon balanced around FHF so that it works better, vanilla is very hard to play without getting angry at its horrible balance.